I usually donâ€™t buy my own make up.Â I make use of whatever my mom and her sisters have.Â They have tons of make-up from different brands that could kill my wallet and credit card and buy them myself.Â Iâ€™d be exposed to these brands just because of them. A lot of people tell me I look better without makeup.Â Itâ€™s not that I donâ€™t know how to apply them, but many say my face features are so strong and pretty that I donâ€™t need make-up.Â I had a fear of going to parlor shops before to have make-up applied on me.Â They usually make me look like a geisha or a ghost or a clown no matter how professional and experienced the make-up artist is.Â I often find myself going to the restroom, get some tissue, and remove some make-up and apply my own compact powder. Now, that I have some little time for myself (on my control), I decided to explore the world of make up.Â Sometimes, if I have the time, Iâ€™d go to my momâ€™s room (just like a curious 8-year-old girl) and explore all the cute little shiny glittery things on her personal dresser.Â I think, make-up is just common sense.Â If it looks good on youâ€¦ it looks good on you!!! and you should know because you see your own face in the mirror. Since airbrush makeup is sprayed on as fine mist over the skin, it produces a natural flawless complexion. It doesnâ€™t rub into the skin or emphasize pores and it allows the skin to breathe through its light texture. You may have only heard of airbrush from a makeup professional or a bride who spent a steep price on a session for her wedding day. So, when you hear of airbrush make up, you immediately assume that you donâ€™t have the skill to handle it or that itâ€™s going to cost you. 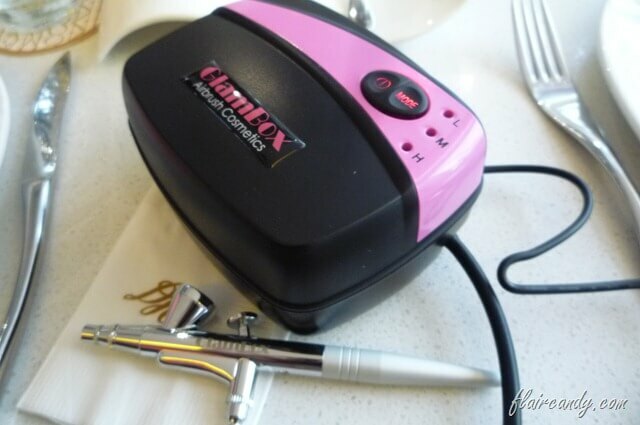 In the past, airbrush systems have been expensive, complicated and hard to find. But now with the GlamBox Airbrush Kit you can easily achieve professional looking coverage and face color every day at the comfort of your home. 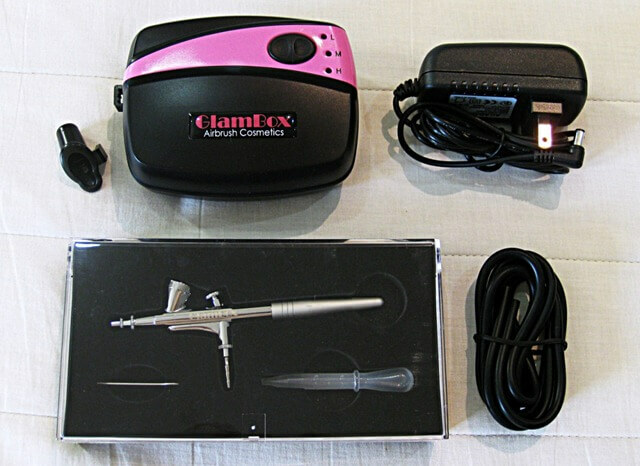 The GlamBox Airbrush Kit is compact, handy and really easy to use. Best of all, it was created with the everyday woman in mind so it definitely comes with a reasonable price tag. I never had a compressor before but the other beauty bloggers have and they have been saying that this is the lightest they have ever seen or used yet. Â· Is lightweight, ergonomic and easy to handle. Â· Is hygienic and easy to clean. 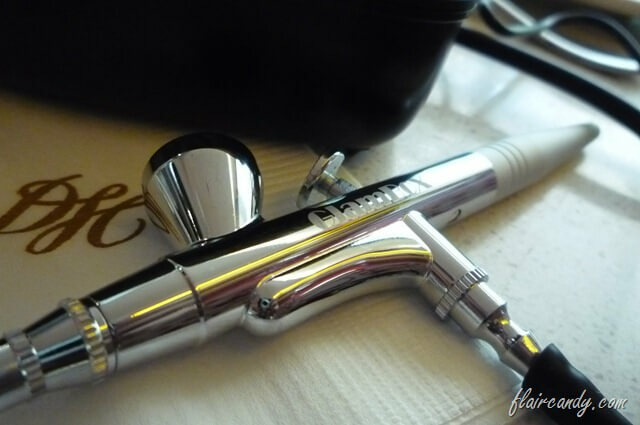 The GlamBox Airbrush Makeup Line produces a flawless, streak free and evenly distributed coverage. Â· It is silicone-based so it easily fills in pores and fine lines. Â· It dries immediately and is water-resistant to sweat or tears. Â· It is long lasting so it does not smudge off and does not need to be touched up the whole day. Â· It is an HDTV (High Definition Television) makeup line so it is ideal for photo and video shoots. Â· It is very versatile. It can be used to contour and highlight facial features. It can also be used to airbrush the body for coverage and for sunless tanning. 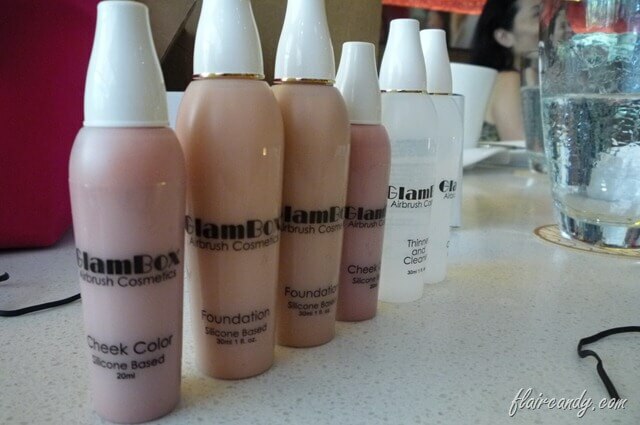 The GlamBox Makeup Line currently comes in: four foundation colors, two cheek colors, one luminizer and one thinner/cleaner. International professional brands like MAC and Kryolan have a similar silicone-based formulation that is widely preferred by makeup professionals. Since, I really wanted to go to event, I stormed from Mandaluyong to Rockwell in an hour.Â I showered, I wore the dress I first saw and raced my way to the event location.Â By 3pm I was thereâ€¦ **phew** â€“ then I realizedâ€¦ I had no make up at all! â€œHi guys, What did I miss”?â€ â€“ I blushed. Apparently, I missed Valerieâ€™s talk but I didnâ€™t miss the actual demo! Probably the girls noticed that I didnâ€™t have any make-up on and they made a demo on me. Shen put some foundation on me using the Glambox Airbrush.Â She did a pretty good job of applying the foundation on me!Â It was a fast application as well and I must say my face looked really natural.Â I donâ€™t have the before picture of me because I forgot but I really looked horrible with bare eye bags (without concealer).Â My face had no foundation and the little minute wounds from my facial the previous day were so apparent.Â **faints**Â Anyway, hereâ€™s my after picture with Cher and Jane who had the airbrush foundation as well. Thank you Sophie for the invite!Â It was nice to finally meet you in person! 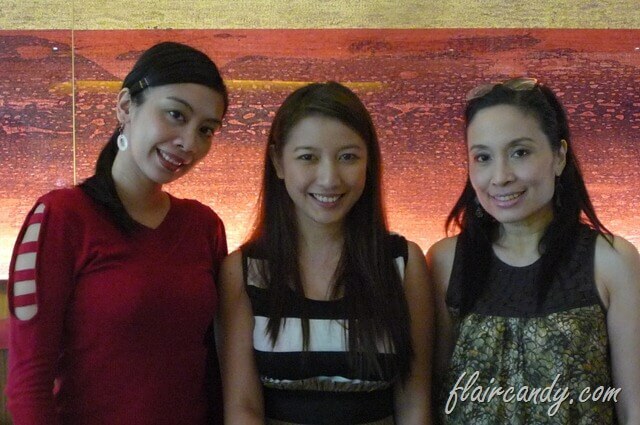 Thanks to Valerie of Glambox for finishing my make-up with a luminizer and for inviting us bloggers to this event. true. kahit walang make-up maganda pa rin. mas-ok yung natural look talaga. ei hannah, good luck sa events organizing thingy mo. do invite me ha. ‘cept if it concerns fashion and make-up. hehehe.